The Fall 2018 Leadership series occurs every Tuesday in Evans Commons 3020 at 4 p.m.
Sara Gregor, who works for the Northwestern Mutual Life Insurance Company and graduated from Lindenwood in 2016, gave financial planning advice as part of the Spring Leadership Series on Tuesday. “Finance 101: Learning your Financial Planning Personality” was held at 4 p.m. in Harmon Hall. To be aware of what must be done to accomplish your goals, college students are encouraged to prepare for financial planning when they transition into living independently. Gregor said finding someone to give you advice and being aware of your financial habits are important parts of this. “Know how you operate, and then you can make good financial decisions,” she said. Budget your monthly expenses. Students filled out a mock budget to learn about expenses. Gregor said rent and housing take up a big segment of monthly budgets. She also advised keeping three to six months worth of expenses in an emergency fund. Take care of your most important asset: yourself. “If you’re not there to put money in your portfolio, it’s not worth it,” she said. When looking for a job, keep in mind things besides pay, such as employer retirement plan contribution, health care, business expenses and vacation days. Plan for the cost of your job, including appropriate attire. Understand your salary structure, benefits and pay increases. “You don’t want to be at a company that you love but there’s no room for improvement,” Gregor said. Plan for short-term, mid-term and long-term goals for the coming years. During the event, attendees assessed their “financial planning personality” using a handout. Gregor recommended the websites The Mint Grad, which provides financial planning information, and vault.com, which can be used to browse reviews of internships and apply for them. This week’s class was moved down the hall from its usual location, Harmon 141, due to technical difficulties. The next installment of the leadership series, “Passing the Torch: Transitioning Officers” will be led by Student Involvement Director Angie Royal on April 3. 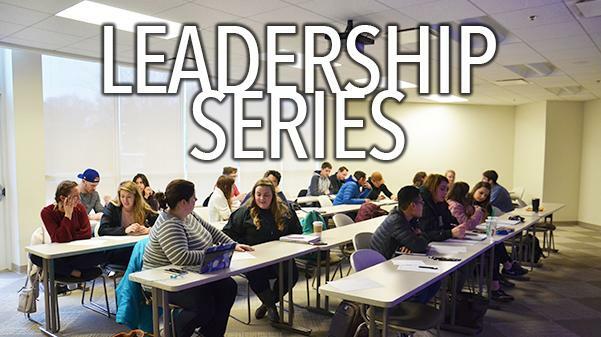 This is the seventh story in a series covering the leadership sessions offered on campus. Check back each week for updates.